Hi, it is Christine from Susan Tierney-Cockburn’s Design Team here. 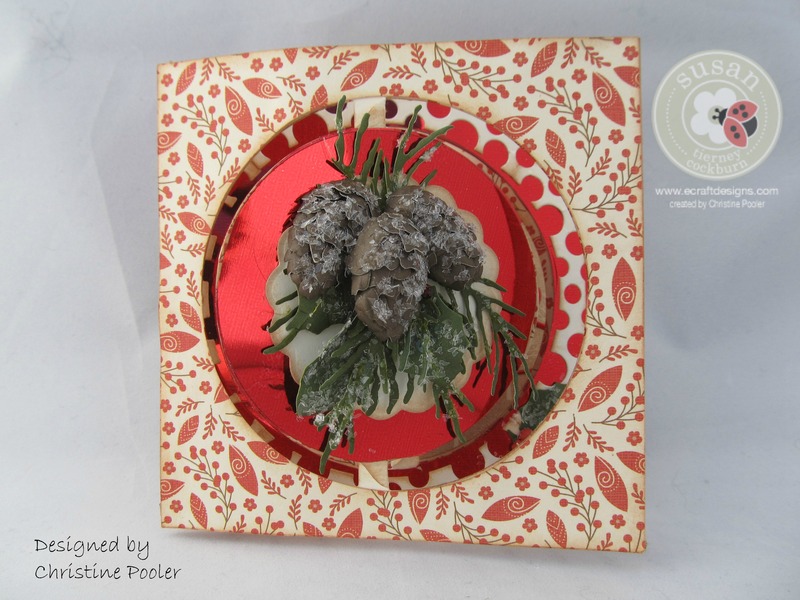 Today I have for you a Christmas card that I have designed using Susan’s Garden Notes “Whitepine Boughs and Pinecones” die along with “Holiday Holly and Berries” die. I just love working with all of Susan’s dies. Here we go! Using the Accordion Circle Card Die die cut 3 panels from off white cardstock, 4 panels from B&T paper (background and texture) and 2 from Shimmer Sheetz. Also cut 1 pc of off white cardstock 4-3/4″ square and 2 pc of B&T 4-3/4″ square. From off white cardstock cut 2 scalloped circles using the largest scallop circle die in this set and 1 from Shimmer Sheetz. 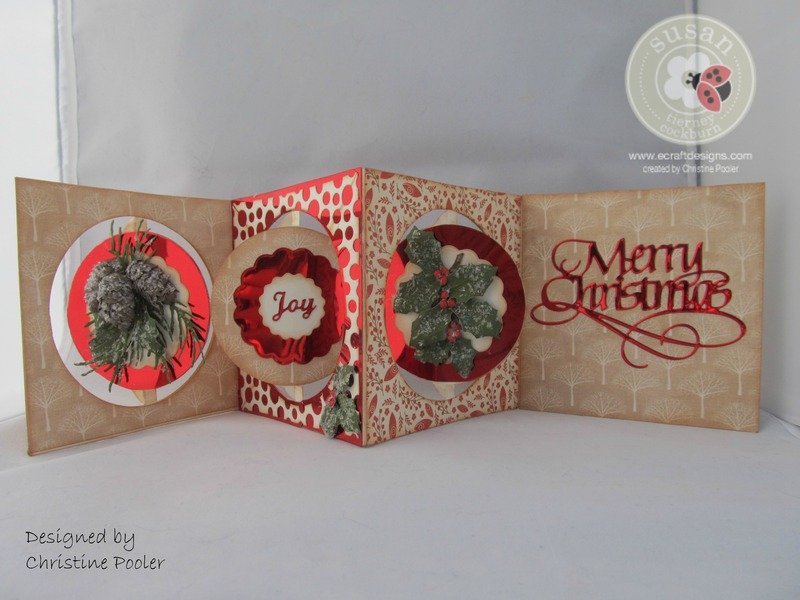 Also From the Shimmer Sheetz cut “Merry Christmas” using the Quietfire die and “Joy” using ECD’s die. Lastly cut a set of frames for the center panel from off white cardstock using the Square w/ Circle Frame Edges – circles. Note: on the items cut from the Shimmer Sheetz and the scallop circles I backed the paper with the Double Sided Clear Adhesive before die cutting. From the 4 B& T panels and the 2 Shimmer Sheetz panels remove the circle and all the tabs. Set these aside as they will be used to decorate your card base. Ink all edges of all panels, your circles (with tabs removed), scalloped circles and frame pieces. Cut, shape and build your pinecones and boughs using Susan’s video found here and do the same for the Holly and Berries using Susan’s video found here. For the icy look I used Dries Clear Designer adhesive randomly and then sprinkled Diamond Dust over the adhesive and shook off the rest. Next build your card base using Karen Burniston’s video found here. Susan’s and Karen’s video are wonderful and very easy to follow. 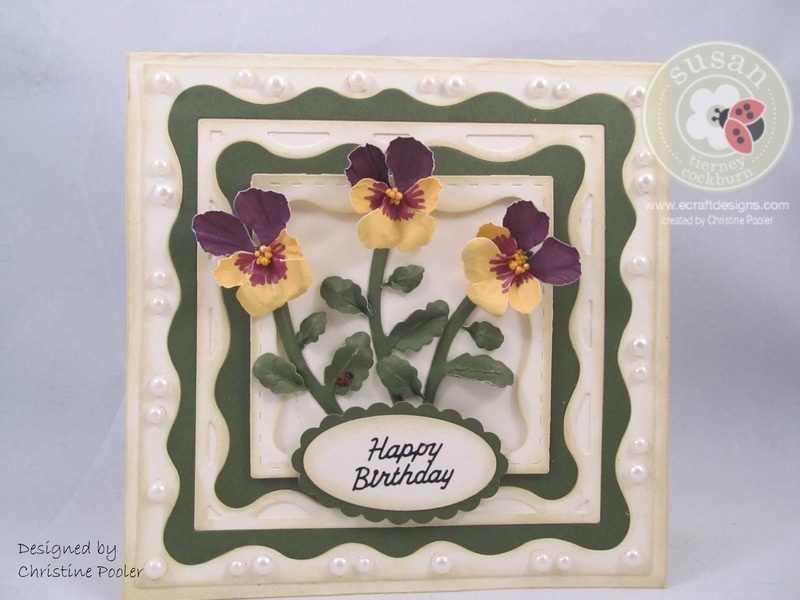 Using your pieces decorate your card. Well I do hope that this inspires you to try your hand at this card – Enjoy!